In March, John and I took a weekend City Break in Belfast. Now, Northern Ireland is not really somewhere I ever expected to go, or ever expected to want to visit, but this City has been transformed over the last decades and is a lovely place to spend a few days. We stayed in the University quarter, which was within walking distance of almost everywhere and we really enjoyed the amazing state of the art 'Titanic' museum, the lively St. George's market, a tour of the parliament at Stormont and the City Hall. The quirky Linen Hall Library was absolutely charming and we even had early evening cocktails at the fabulous Merchant Hotel. However, my favourite place to visit was the Ulster Museum and the surrounding Botanical Gardens...in particular, the Palm House. The botanical gardens were first opened in 1828, but the Palm House came a little later in 1840. It was designed by Charles Lanyon and is one of the earliest examples of a glass house using curvilinear cast iron. Lanyon went on to design the famous and much larger glass house at Kew Gardens in London. Built by Richard Turner, it is absolutely charming and from the moment you step inside, it is quite magical. Brimming with exotic and unusual plants, the flowers fill the air with a tropical atmosphere that transports you from blustery Belfast to an altogether more interesting plane. I went back to visit again the next day and if I only had somewhere like this locally, I am sure I would be forever holed up in this leafy paradise. As soon as I came home, I started thinking about the idea of an embroidery based on this little bit of heaven. It soon began taking shape. I transferred my sketch onto the fabric by printing it out on light weight printer paper and then pinning it on top of the black fabric. Then, using a largish stitch on my sewing machine and white thread, I stitched around the outline, before tearing away the paper. It worked really well. 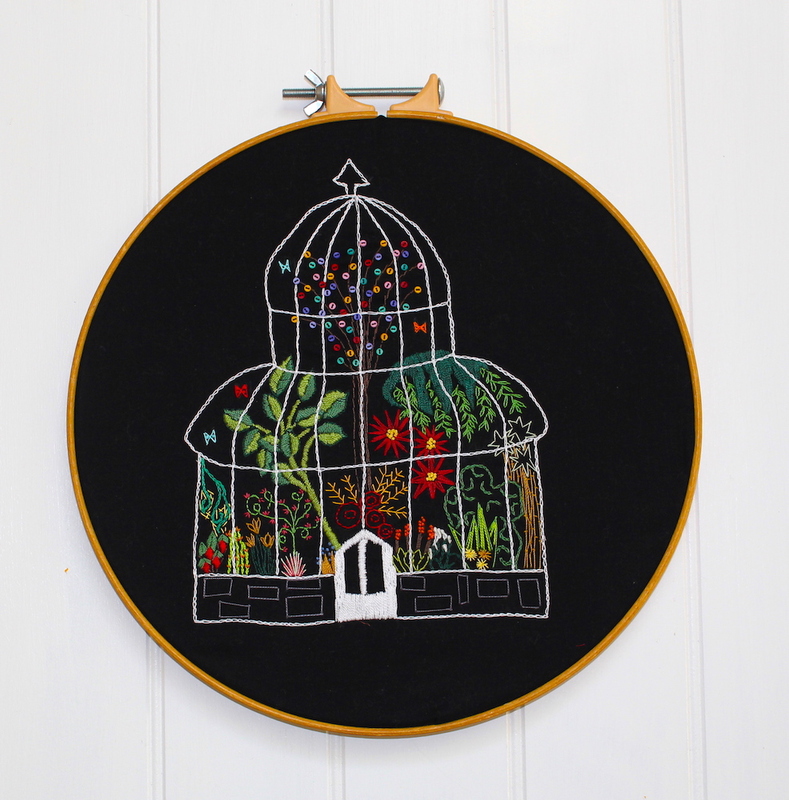 I began filling my Palm House with a riot of colourful plants and added some teeny tiny buttons in to give it some texture and a little quirkiness. Once it was done, I was amazed at how pretty it was and decided to make it into a pattern. You can buy this in my Etsy shop 'here' as a downloadable pdf, printed pattern or a kit. 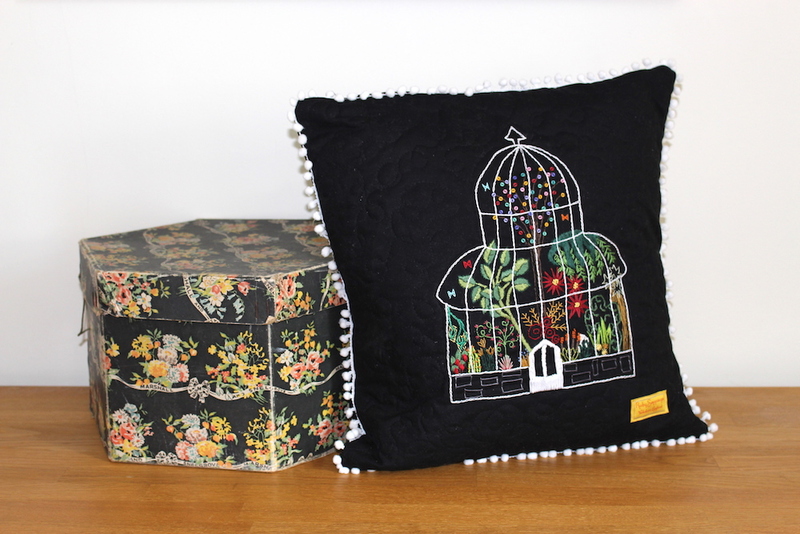 I also hope to be selling the teeny tiny buttons and pom pom trim in the Haberdashery section in the shop, which might be helpful if you want to make your embroidery into a cushion. Details of how to do this are included with the pattern. Hope you've enjoy reading about this and will take the time to pop by my shop.